For a long time, I’ve been trying to make sense of Kanye West’s 2016 album The Life of Pablo. In fact, you could say I’ve been a little obsessed with it. It is, after all, a confounding record. It’s almost a cliche by now to point out how fragmented it is in comparison to West’s earlier albums, how plain incoherent. TLOP careers from one idea to to the next with seemingly no regard for things like good taste or cohesion or even, at times, sense. Despite this, Kanye called it the “best album of all time”. He modestly asserted that the appropriate rating critics should give it was “30 out of 10”. This is obviously almost comically boastful, but Kanye’s opinions of his own albums are not to be taken lightly. Indeed, they tend to be pretty damn accurate. So how, then, do we reconcile the two perspectives? The Life of Pablo is clearly a mess, but could Kanye be right too? Could it be a masterpiece? The answer, it turns out, can be found in an unlikely source: French Post-Impressionist painter Paul Cezanne. I know what you’re thinking, but hear me out. Kanye and Cezanne have more in common than you might think. Both were boundary-pushing creators. Both produced work that was only fully appreciated long after it was made; Cezanne was already dead by the time critics recognized his influence on later movements like cubism, while Yeezy’s 808s and Heartbreak only revealed itself as one of the last decade’s most influential hip hop albums years after its release. But the most important link between them comes in Cezanne’s approach to making art. Specifically, Cezanne explored an aesthetic known as ‘non finito’: art that is intentionally left unfinished. That’s why, with Cezanne, the brushstrokes on his canvasses are often clearly visible. He would sometimes stop working on a piece, only to come back months (or even years) later and change it. As a result, his paintings frequently feature large spaces of white, where the blank canvas underneath shows through. Sometimes you can even make out earlier sketches of the image beneath the final one. Paul Cézanne, ‘Portrait of a Woman’. 1902–1906. Kanye approaches The Life of Pablo the same way Cezanne approached these paintings. Tracks like ‘Father Stretch My Hands Pt.2’ are clearly fragments of multiple songs stitched together, with all the seams showing. ‘Pt.1’ features a looping sample (“You’re the only the power,” it states, over and over, “You’re the only power that can — ”) without ever finishing the thought. Then there’s ‘Fade’, which ends in the middle of a bar, and ‘Frank’s Track’ which sounds like a raw, broken synthesizer. Like Cezanne’s work, these songs come across as unfinished — but that’s part of their charm. Not all of Kanye’s fans thought so, however. In the wake of TLOP’s release, some of them took to Twitter to complain about the album’s unfinished sound. Interestingly, Mike Dean, one of the main producers who worked on The Life of Pablo, dismissed their criticisms. “Any distortion u hear on Pablo is intentional,” he tweeted. “It’s nice and edgy. Like @kanyewest”. We haven’t heard much about the creative process behind TLOP, but so far a lot seems to indicate that the album was, as Dean says, purposefully engineered to feel unfinished, in contrast to the polished achievements that were Kanye’s previous albums, My Beautiful Dark Twisted Fantasy and Yeezus. The chaotic promotion strategy for TLOP seems to support this. The album went through numerous name changes before its release (first it was So Help Me God, then Swish, then Waves).Then there’s the tracklist, which also mutated from day to day. The final cover reflects this messiness too, with all its disordered lines and jarringly-placed images. But the parallels with Cezanne’s ‘non finito’ style extend further than just the sound of the album. You can see them in the album’s form, too. 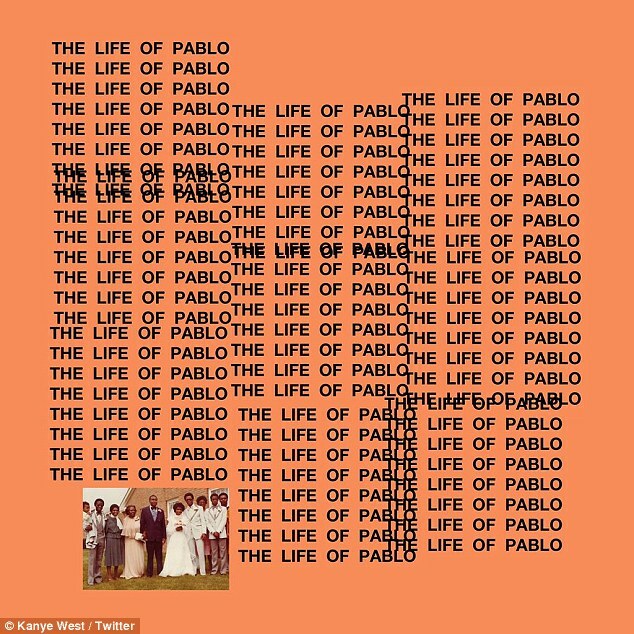 Kanye released The Life of Pablo exclusively to streaming services. As a result, he was able to tinker with it long after its release. Over a few months, West changed lyrics, tweaked the production and, in the case of ‘Saint Pablo’, added whole new tracks. In this way, TLOP is less like a traditional album and more like an app that its creator is able to update at a whim. This allowed Kanye to take the ‘non finito’ approach to even greater extremes. By making it a streaming exclusive, he challenged the idea of music ever being finished, at all. Kanye’s decision to confine TLOP to streaming services was met with skepticism, but it seems he’s been vindicated. (TLOP was the first album to go platinum entirely from streams, after all). This might be TLOP’s most enduring legacy. The album has been around for only eighteen months, but it has already prompted artists like Future and Young Thug to make post-release updates to their music, too. If other musicians follow suit, then The Life of Pablo might go down as a milestone, a groundbreaking release. So, to go back to the initial question: is The Life of Pablo a mess or a masterpiece? Easy — it’s both; an unfinished epic, a sonic Cezanne. More than that, the album’s messiness and mastery are inextricably linked. The unfinished nature of The Life of Pablo is the sound of a restless artist forever unhappy with his work, always tinkering, always striving for perfection but never quite getting there. Kanye clearly wanted to make something as grand in scale as My Beautiful Dark Twisted Fantasy, as innovative as Yeezus, and as fun as Watch the Throne. To anyone else, it might have been clear that such a project was impossible, but Kanye tried anyway, and pushed himself to breaking point in the process. It’s not surprising that he was hospitalized for exhaustion at the end of 2016. And this isn’t an anomaly, either. Kanye’s always been like this. This is the dude who mixed Stronger seventy five times, who spent years working on The College Dropout. It’s just who he is. There’s something fascinating about creators who will stop at nothing in pursuit of perfection, even if it means pushing themselves to their limits, or working on their art long after any other artist would have considered it finished. I think that’s why even today people still travel from around the world to look at Cezanne’s work, and why I’ve spend the last year obsessing over The Life of Pablo. It might just be Kanye’s, too.